Call out the Instigator | Y'all Behave! Nannying for siblings, which is often the case, I run into a flood of familiar issues. Familiar because, as the middle child, I have experienced the clashes between both younger and older siblings. I know all too well the numerous nitpicky, negative nonsense that goes on with siblings due to proximity, personality clash, or just plain frustration. When you have siblings, you are with them day in and day out, and no matter how much you love them or how awesome they are, (none more awesome or loved than my own brother and sister, I might add) there are times when conflicts are inevitable. I see it all the time with my charges, especially with brothers —the older one is annoyed by the younger one, or the younger doesn’t want to play with the older one— the problems arrive from many different, but similar scenarios. Many times the kiddo in the wrong is easy to decipher: one is refusing to share, one hurts the other, one is being mean with words. However, sometimes, the perpetrator of the playtime foul play is not as clear and requires a bit of detective work on my part. Doc and Rebel run into the same sibling squabbles as much as any other kiddos. After lunch, they play in the living room while I keep an eye on them from the kitchen as I clean up our post-meal mess. Several times I have blamed Rebel for the trouble, as he has usually hit or pushed Doc when I’ve looked up, but after remaining hidden from their view, hidden but watching, I’ve seen that Doc has initiated quarrel, inciting Rebel by snatching a toy away or pushing him, then Rebel reacts. Those older children can be very sneaky to avoid nanny detection(and blame)! Rebel has become hip to this jive and has himself been the instigator too, landing Doc in trouble. I’ve experienced this exact same scenario with past charges, and have learned that if I’m not an eyewitness to the transgression in question, I must always ask the kiddos how the conflict started. 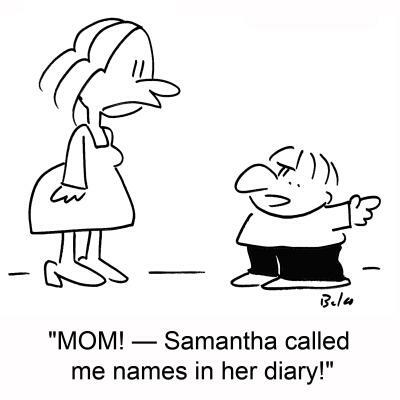 The kiddos are most often honest, too flustered being caught with their behavioral pants down to come up with a lie on the fly. And so to bring justice to the homes of the kiddos, I must at times play witness, judge, and jury, and call out the instigator.